J is for Jesus. Mostly, if you rea d the gospels, a very likeable chap. Mystical, yes. Unpredictable, very. Would you have hung out with him? And if you would… for what reason? Because no doubt about it, he was pretty rebellious…and exciting… Would you have enjoyed the drama? Would you have liked it that he caused a stir? Would you have been attracted by the cool magic stuff? Would you have been drawn to his intense love and his wisdom? 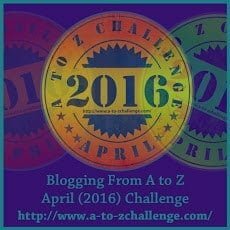 Tagged A - Z Challenge, Beliefs, Blogging, C.S.Lewis, Earth, God, Jesus, Life, Mere Christianity, Quotations, Random, thoughts, Who is Jesus? If your default state of mind involves a relentless drive towards perfection. Rebel against your own state of mind. Whether you do or you don’t, this vid is worth watching, if only for the beauty of the sketching! And it IS a whisper, because I am so uncomfortable with expressing a belief that to a great many people, will seem ridiculous, horribly humbug-ish, off-puttingly evangelical, or just plain crackpot! I hate the idea that I am in any way an ‘over serious – too prescriptive – fundamentalist’ Christian, and so often this leads me to stay quiet on the subject of evil. But this is the truth about a belief I hold somewhere, deep down, embedded in my sense of spirituality and given the deathly, festive feel to a lot of blog spaces at the mom ent, I am going to give my two pennyworth! I should probably explain (in an off handed manner) that I “don’t mind if OTHER people want to dress up as witches and ghouls and zombies and devils”. “That’s FINE. It’s just not for me”. But actually, I DO mind. I do mind that every year, we make a joke of something that is really very serious. I do mind that while we while away hours playing with ghoulish things and partying with blood and fire and all kinds of whacked out representations of the devil, ‘real’ evil is creeping round, enjoying the kudos, harming people who playfully open their minds to it. What I most object to about Halloween, is the fact that in our preoccupation with the paranormal, and our laughter at the concept of all things ghoulish, we make a mockery of an evil that is so fearfully real, that were it to be unveiled before us, we would quake and cower and beg for mercy. Now I’m stepping down from my (non orange) soapbox. I know it’s controversial but… any thoughts?